This is a common Philippine endemic. The species was split from the Red-keeled Flowerpecker (Dicaeum australe). It is about 4 inches long. It has a black head, white body, and a very distinctive bright red keel bordered in black that looks like a bloody gash. The Red-keeled Flowerpecker's keel is plain red, without the black border. In bird anatomy, the keel or carina refers to a projection found on the breastbone of most flying birds. Their breastbone is not flat, but shaped like the keel of a boat. Birds that don't fly like ostriches have a flat or raft-shaped keel. 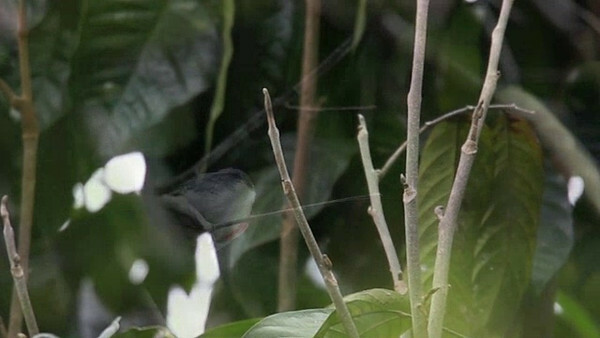 We saw this bird in the backyard of Rene Vendiola, the top bird guide in Dumaguete. He planted native trees, fruit trees, and native flowers like the medenilla in his backyard to attract the flowerpeckers and other birds. The best time to visit his backyard is in the morning. We were still able to see the Visayan Flowerpecker, even if we went to his house late in the afternoon. They were pecking at the guavas on the trees.